At some point after the foundation was done, dirt was brought in to build up and level out the ground around the foundation on the high side of the lot. At Judy's house, enough dirt had to be excavated on the site to reuse it to level up other parts of the site, so no additional dirt (or what is called "city pit") had to be brought it. City pit is pretty poor stuff. 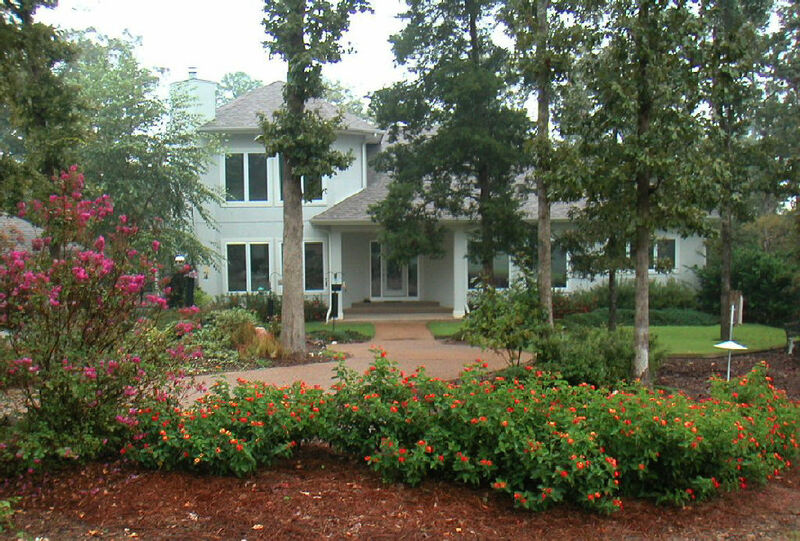 A landscaper will bring in top soil to put on top of it or in holes dug into it if needed. If your builder is going to bring in city pit for leveling, you may want to consult with a landscaper to see if it would be worth the cost of using higher quality soil. 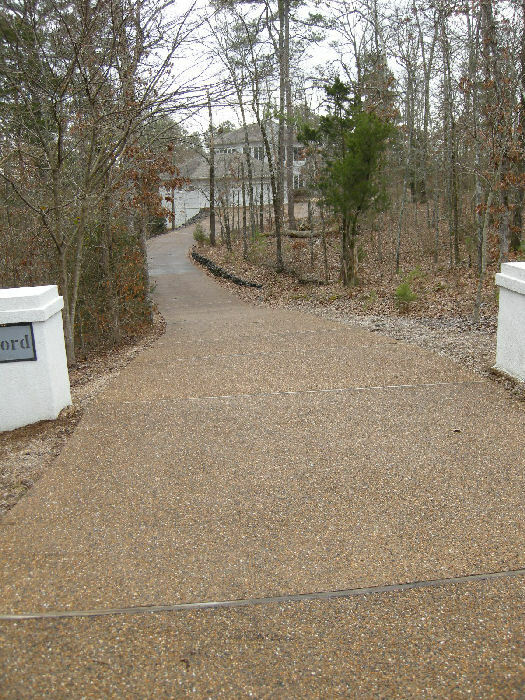 After all the exterior work on the house was completed, the driveway, sidewalks, and front porch were poured. This was an interesting experience for us. We came by when they started and saw them smoothing out plain concrete. When we came back later, the concrete had smooth stones embedded in it ("exposed aggregate") providing a very attractive surface. We were mystified as to where the stones came from, since we did not see any piles of stones anywhere. Craft explained to us that the stones are in the concrete to start with -- you just can't see them when the concrete is being smoothed. After the concrete is smoothed, a mixture of sugar and water is sprayed on top of the concrete. This keeps the very top layer of the concrete from setting up. After the rest of the concrete has set up, a water hose is used to wash off the top layer of concrete, which exposes the stone aggregate. This look is probably the most commonly used, at least in our area of HSV. At Judy's house, the builder said that exposed aggregate on her steep driveway would be slippery when wet, so he used a rough (brushed) finish on the concrete. The steep part of our driveway is not slippery. I noticed that the stones used in Judy's concrete mix were not the attractive kind use in exposed aggregate, so the non-exposed approach may have been cheaper, as well. And speaking of cost, if you want to get fancy, you can have the concrete dyed and stamped like the front porch and back patio at Judy's house. Because our house is 200' off the street, we were concerned about having enough parking up close to the house. We considered having a pull-in parking area for a couple of cars to the side of the driveway, but we finally decided to have a circular drive come around some trees and in front of the front porch. Not only were we concerned about how this would look, but whether pouring concrete over the roots of the four large trees in the center of the circle would kill the trees. After being reassured by Craft and others that it would not kill the trees, we decided to go ahead. We hope that the trees survive (not only the concrete, but all the running over by heavy equipment during construction of the house), because they certainly look great in the circle. And more importantly, our house faces West, and without the shade those trees provide, our big windows would be letting in a direct blast of sun which could prove to be unbearably bright and hot. Update: Two of the four trees in the circle died within two years, but after 9 years, the other trees are still doing fine. Although the circular drive provides more parking space, it is not wide enough for cars in the middle to get out of once the whole circle is filled with cars, which somewhat defeats the purpose of having extra parking. So our landscaping plan called for one area to the side of the circle just to be covered with bark and no plants. Two cars can pull off the circle onto the bark and not block the circle. We could have covered that parking area with gravel, but that would have made it stand out more. The bark will blend in with the surrounding area. Update: Nobody has ever used this unpaved parking area. We would have to be standing outside to guide people into these areas. The circular drive also lets us have a short sidewalk to the front door, which is nice when you are unloading things from a vehicle. Otherwise, we would have had to curve a sidewalk over from the driveway in front of the garage. The front porch was a matter of some debate. We would have liked the sidewalk to ramp up to a porch that would have been on the same level as the front door for easy wheelchair accessibility. Craft kept insisting that we have a couple of stairs from a lower front porch into the house. I finally went to the floor plan software in my computer to see how the porch would look with no steps, and it looked too squat, so once again we went along with Craft's recommendation. It does look good now that it's done, although Kay often wishes we had room for a swing or a bench. The following things will improve the quality of a driveway. Be sure to put them in your contract specs to ensure that you get them. Microscopic air bubbles provide significant "give" to the concrete when the water in the concrete freezes and thaws, helping to prevent surface deterioration. Typical air entrapment in concrete should be 5%-7%. Excess water added to concrete will greatly (or completely) reduce the bubble structure. The compressive strength of concrete is expressed in pounds per square inch (psi). Areas which get a large number of freeze and thaw cycles, such as HSV, require a higher psi -- normally around 4000 psi. If your builder tells a concrete producer simply that he wants concrete for a driveway, you may only get 3000 psi. Be sure that you specify 4000 psi in your specs/contract with the builder. Higher psi is more expensive, but not tremendously so, and will more than pay for itself if it prevents cracks in the driveway. Strengthening the concrete with rebar is commonly done, and polypropylene fibers can be added for additional reinforcement. Preparing the ground to keep it uniform in firmness, levelness, and composition (all dirt with no boulders) will reduce the stress on the concrete. If dirt/fill must be brought in to build up the area for the driveway, it should be compacted with a vibrating compactor; otherwise, the fill will eventually compact and create an uneven bed for the concrete and thus lead to cracking and/or sinking of a section of concrete. The thickness of a driveway should be at least 5" to handle cars and light trucks. Loaded moving vans, dump trucks hauling landscaping material, etc., may damage your driveway if it is less than 6" thick and not reinforced.. Proper jointing (with wooden strips/boards) will relieve stress on concrete and help prevent cracking. The closer together the joints, the less stress is placed on the concrete, thus the fewer cracks. Over time the wood dividers will deteriorate and need to be replaced. Synthetic dividers can be used instead. Placement of concrete when poured should be as close as possible to its finished position. 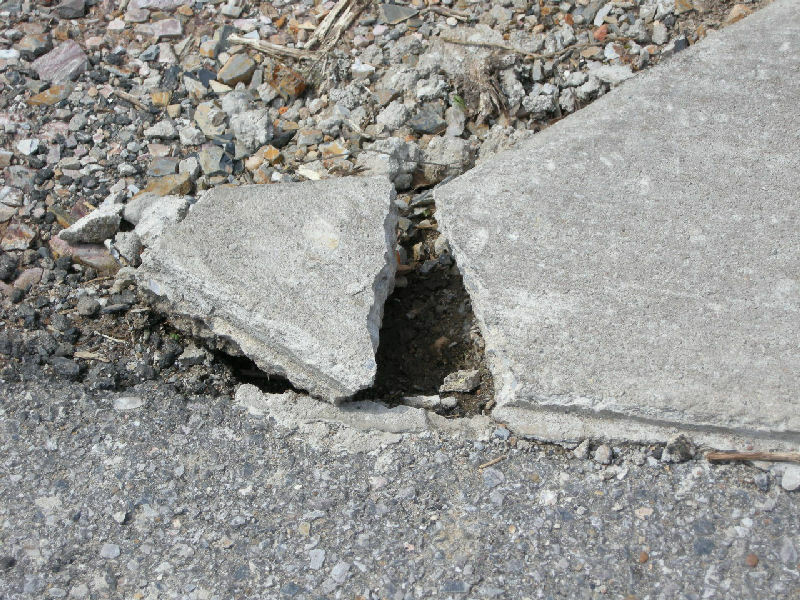 Excessive horizontal moving of the concrete, as well as dropping it from more than 4 feet, can cause separation of the mix and result in future problems. Use shovels to lift and move concrete from one spot to another rather than pushing or raking it. Surface bleed water must evaporate before finishing the concrete. If exposed aggregate or stamped concrete are not to be used, a concrete broom is used for the final finish to provide a rough, non-slippery surface. Curing of the concrete is extremely important and takes 3-7 days. 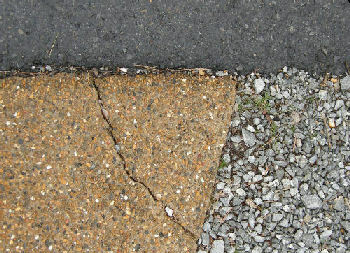 Improper curing may cause the concrete to lose as much as 50% of its strength from drying to quickly in hot weather or freezing in cold weather. We see driveways routinely poured in these weather extremes with nothing done to protect them. Use evaporation retardants or fogging/misting equipment or cover with a vapor-proof sheet immediately after screeding. Temporarily place moistened burlap cover over fresh concrete to be removed by the finishers. Apply a spray-on curing compound. 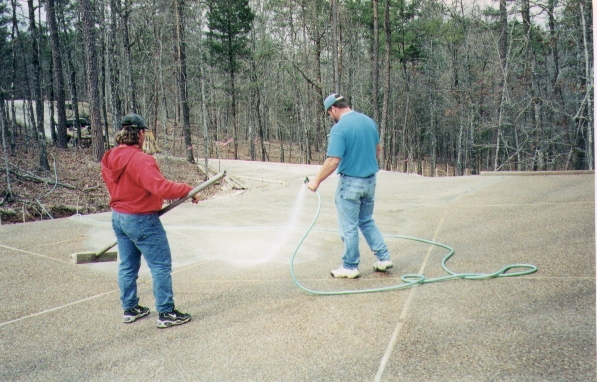 Apply a sealer 30-60 days after pouring (i.e. : allow time to cure). Do not place concrete on frozen ground. The fresh concrete should be kept at 55 degrees or higher. For a short driveway, a heated enclosure may be used, though drying too quickly must be prevented by frequent sprinkling; otherwise, use waterproof covers for at least 7 days at temperatures above 40 degrees. Leave the forms in place for at least 30 days. When cured, immediately apply a penetrating sealer. At other times of the year, a curing compound can still be used, but alternatives include covering with polyethylene, or frequent sprinkling. 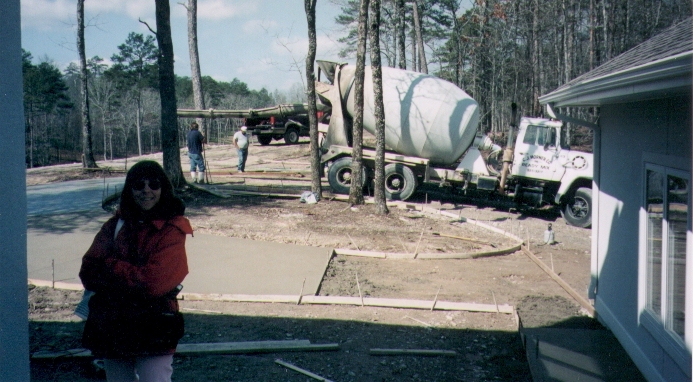 During new home construction,it is highly unlikely that anyone could be relied on to frequently sprinkle the concrete. On the other hand, during the Fall and Spring in HSV, we usually get frequent rain, which should be sufficient. The same things that influence the quality and strength of the concrete in a driveway will, of course, have the same effects on the concrete foundation of a house. This would concern me enough that if I were planning on starting construction of a home in January through March, I would, if at all possible, postpone it until the first of April. This would have the additional benefit that the driveway would probably be poured in the Fall before the first freeze. Likewise, if it were after August and I was trying to get a house started, I would push hard to get the applications into the building committee no later than the first part of October so that the foundation could be poured by the first part of November before freezes hit. And note that if it will take 8 months for your house to be complete, the driveway would probably be poured about the 7th month. This means that if you start in July-August, the driveway will come due about January-February, which is the worst possible time. Sealing to keep out water after the concrete has cured will prevent damage due to freezing. Prior to the first freeze, the new driveway should be sealed. A penetrating sealer provides the best protection. Plan ahead for electric and water lines Putting PVC pipe in the ground before pouring the driveway will allow you to get power and or sprinkler system lines across the driveway in the future. One pipe close to the garage and another out near the street will do for short driveways. More pipes should be placed for very long driveways. Place pipes under sidewalks as well. See this page for how I would specify a driveway today. Run a piece of rebar into the corners, even if the rebar is not being used in the rest of the driveway. Barricade the driveway for no less than a week (and as much as 30 days) to make sure nobody drives over it before it has cured. Help ensure the overall quality of the concrete by making sure the steps explained on this page and these specs are followed. As you can see below, this broken corner had no reinforcement. it was actually LESS thick. To repair such a break, you will need to drive a 1/2" reinforcing steel driven about 3"-4" deep into a 1/2" pre-drilled hole using a 4 pound or heavier hammer. A hammer drill may be needed to drill the hole. Drill the hole in the center of the old concrete The pin will last longer if you paint it first with a good metal primer. Make sure that the ground where the patch will be poured is properly prepared and is damp, and that the pin sticks well into the area to be poured. After pouring the new concrete, cover it with plastic and douse the patch with water after it becomes stiff and for 3-7 days thereafter. As said elsewhere, don't patch in freezing weather. If it is hot and sunny, shade the patch and protect it from drying wind. And don't forget to barricade the patch so that nothing disturbs it for a minimum of 7 days. 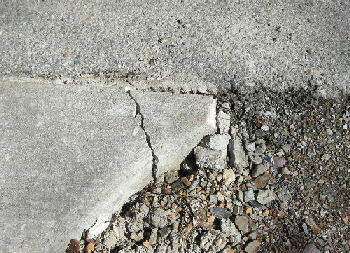 Other cracks in the driveway can be repaired with materials available from home centers like Lowes. In 2015, we hired a fellow to repair cracks in our driveway and to "mudjack" sections which has sunk into the ground. Mudjacking consists of drilling holes (3" or so) through the concrete and using a large hose to pump concrete under the section. Before pumping, holes can be dug at the sides of the section and large jacks put under the slab to jack it up to where it is level again. This makes it easier to get the concrete under the slab. Cracks are normally made uniform with a saw and blown out with compressed air. It may be difficult to get the material used to fill cracks to match the color of the rest of the concrete. There are materials which comes clear and can be made to match using colored powder such as is used in dyed concrete, but the fellow doing our job didn't know about that. Since filling the cracks is largely cosmetic, it defeats the purpose (and thus wastes money) to fill them with material that makes the stand out even more. It costs about $1200 to have 4 sections of the driveway leveled plus having cracks repaired across about a half-dozen sections (which included cracks in the sunken sections). We got a bid on having on having the cracked/sunken sections jack hammered out and repoured. It would have been about $5500 and the color of the replaced sections probably wouldn't have matched the old sections.